Sergio Garcia isn’t nicknamed El Nino (the boy) for the heck of it. His precocious talent was regularly derailed from true greatness by a petulant knack of infantile tantrums, spitting in golf holes, lamenting he “wasn’t good enough to win a major” to his latest meltdown at the Saudi International. Not only did he deliberately damage five greens, he took out his frustrations on an innocent bunker as well. It probably didn’t surprise longtime followers/detractors except, it did appear Sergio had finally matured after his recent marriage, new child, winning the Masters and essentially winning at life. And that’s too bad, because I believe many had come around on Garcia–including me. He was more open, more relaxed, enjoying and appreciating everything his blessed life delivered. But golf has the distinct power to make even the calmest folks spontaneously combust. It appears that Sergio was frustrated with the greens very early on in the week. 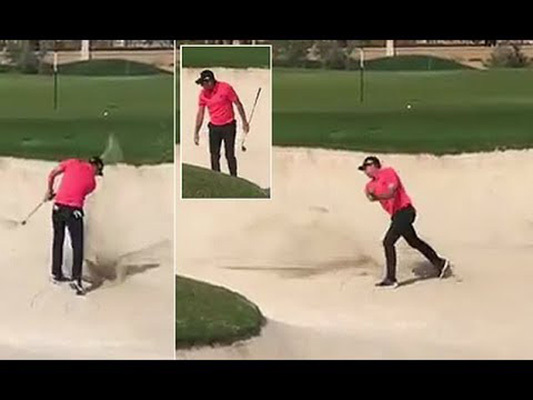 Then, on Friday, Garcia was involved in a separate incident of slamming his club into a bunker out of frustration for the lie he had, one he believed was created by a previous group’s poor raking of the sand. Then came Saturday’s incident. We don’t know if Garcia’s frustration in the third round was general or specific, but for whatever reason, he apparently decided to gouge a number of greens with his putter. Sergio’s act of extreme peevishness is unprecedented, and it fundamentally alters the course of his career—after a youth spent vacillating between unpredictability, dynamic golf, and uneven pressure play, Sergio transitioned in his late 30s into a Masters champion, one of the greatest Ryder Cup golfers to ever live, and an elder statesman of the game. Now? He’s in disgrace, and the ignominy is entirely of his own making. We may never understand the dark mental turns that convinced him to damage those greens, one after another, but the damage to his legacy is crystal clear. And even though Sergio profusely apologized, the incidents were too numerous to be considered anything but premeditated recklessness. That’s a rough legacy to overcome.